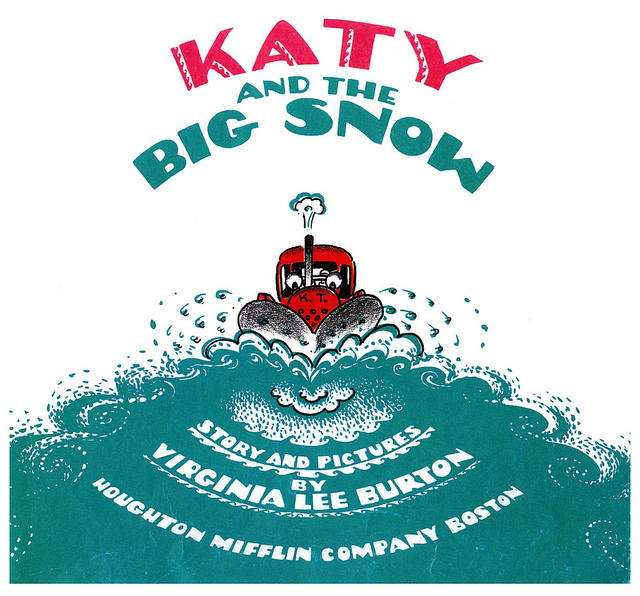 “Katy and the Big Snow” is a classic children’s story from 1943. It had been five years since Virginia Lee Burton wrote “Mike Mulligan and His Steam Shovel.” Now she turned her attention to another piece of talking machinery — this time, a big red snow plow. Katy is “a beautiful red crawler tractor” that belongs to the city of Geoppolis — and this book shows her in several detailed drawings. When the city is snowed in, there’s a two-page spread that’s almost completely white — representing snow — with Katy appearing in the upper-left corner beginning to clear out a path. Gradually more parts of the city start to appear on the pages, as though Katy has released them from enormous white snow drifts. That’s the book’s big surprise — watching the parts of the city appear from the big blanket of snow. I remember being frustrated by this book when I read it as a child. It seemed like there were too many pictures — and the text didn’t really tell a story. It just offered random facts about the city’s highway municipal department. (“When winter came they put snow plows on the big trucks and changed Katy’s bulldozer for her snow plow….”) Some of the dialogue actually comes from the Superintendent of the Water Department. Katy plows out the city — then goes home. The end. Here’s an interesting thought about this book — it was written in the middle of World War II. America was rationing foods, fuels, rubber, and even shoes. Franklin Roosevelt had expanded the size of the government, and now men were leaving their families to serve in a larger national effort. Great efforts were made to assure Americans that we were all in this thing together. And when the city was covered by an enormous blanket of snow — Katy the big red snow plow came and plowed everybody out. ← New Dr. Seuss Book Released!